I have a baby wok. It is cast-iron and metallic grey with a crackly surface texture, something reminiscent of elephant skin. My wok has a round bottom, two handles, and aspirations - or rather, I have aspirations for it. It is simple in shape and material, and will eventually be able to tell its own story through the patina it will develop on its surface - the sort of thing that takes time, and countless meals. This relatively new addition to my kitchen has been sitting on my stove lately next to my old cast iron pan - one black and slick, the other young and fresh with barely a bruise of color beyond the grey. If you have a minute, I'll tell you how it got here. This all started when Grace Young took me wok shopping in San Francisco's Chinatown a few months ago. Actually, Grace and I chatted about wok cooking while signing books next to each other last year at a conference. I told her how my dad would cook with a wok once or twice a week when I was a kid, after taking classes at the local junior college. Grace and I agreed it would be fun to go wok shopping the next time she was in San Francisco. I'm junior varsity on the stir-fry front and I was excited that Grace was game to talk me through my wok options. And she did! 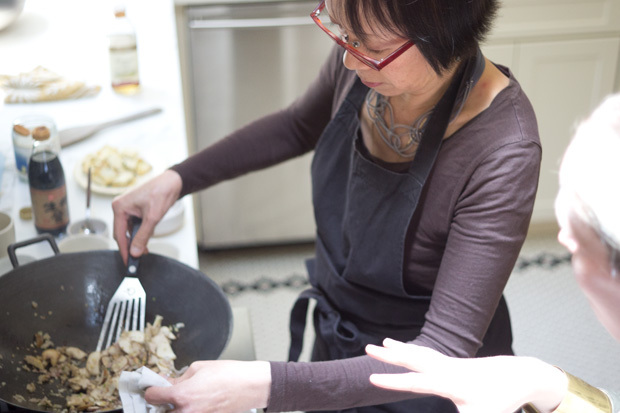 Grace is awesome, and her enthusiasm for wok cooking is infectious. I came home with the perfect wok. Now, I believe in serendipity, and although I suspect Grace had planned to set me up with a carbon steel wok (which I think would have been perfectly nice to cook with), fantastically practical with it's flat bottom and wood handles. Tane, the owner of The Wok Shop, had a run on those the previously day. Instead, a traditional Chinese-made cast iron wok was handed to me - the kind Cantonese home cooks swear by to impart the coveted taste of wok hay. There are few things I love more than cooking in cast iron, and I knew in an instant this was the wok for me. In the months since, my wok and I have become fast friends. I think people have the idea that cast-iron is fussy, but it's really not so. My cast iron skillet is as slippery as any non-stick, and my wok is well on its way. 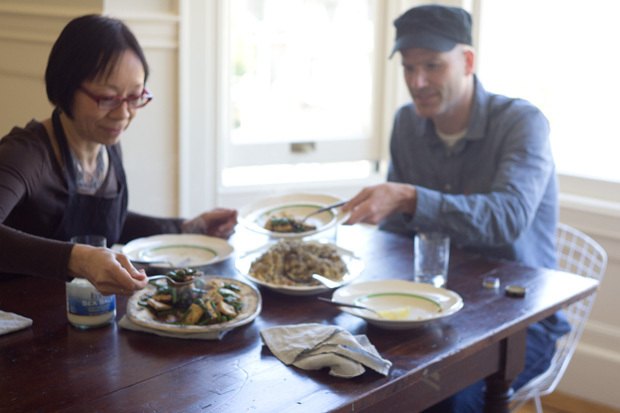 Grace was in SF last week, and she came over for lunch (and to take my pan for a spin). It was fantastically helpful to see some of her cooking techniques in action. 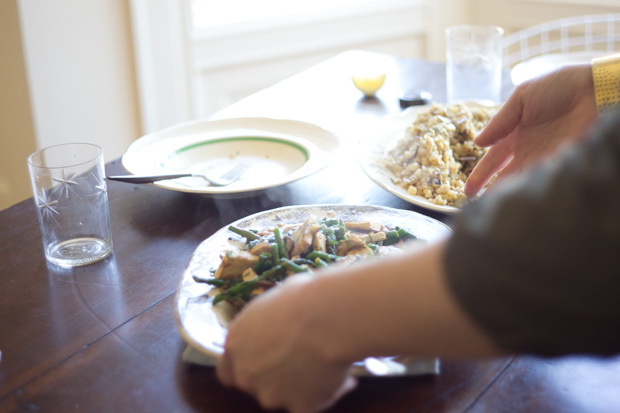 We made two dishes with fresh ingredients I'd picked up at the farmers' market. 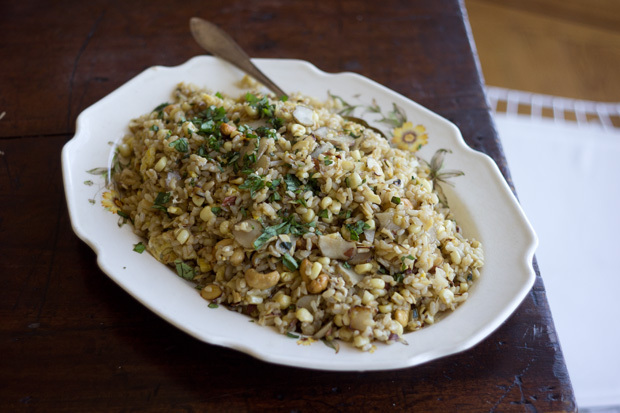 This one was a simple fried rice stir-fry made with day-old brown rice, sunchokes, sweet corn, toasted nuts, and punches of flavor from basil, ginger, garlic and the like. Big thumbs up. I wrote up the recipe down below. I'm still getting my head around which oils I prefer to use for stir-frying, but have had good results with Spectrum sunflower and peanut oils - Although they're both refined to allow for the high temps encountered in stir-fry, but my sense is that they start with good organic ingredients, and use natural refining techniques. Some of the other fats/oils I like to use in relation to high-temp cooking (coconut oil, clarified butter, etc) would definitely lend a not-always-welcome flavor profile to some of these stir-fries. Start by making a thin egg pancake/crepe by adding one beaten egg to a hot wok (or well-seasoned skillet) that has been coated with about 1 teaspoon of oil. Carefully tilt the pan so the egg covers the bottom as thinly as possible. Cook until the egg is just set. Flip and cook the other side before removing to a cutting board. Let cool, then cut into bite-sized pieces. Set aside. Now you're ready to stir-fry the rest. Make sure all your ingredients are prepped and at the ready, because this goes fast. 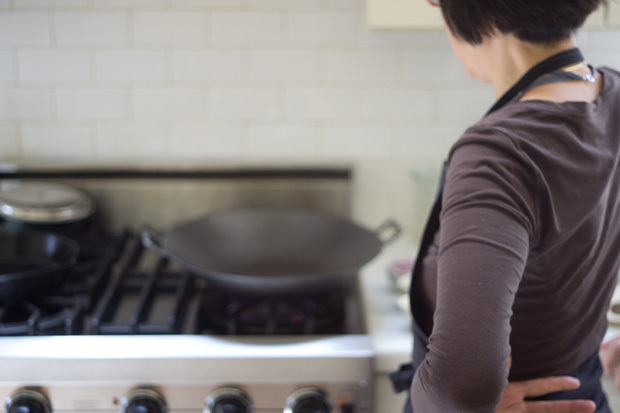 Heat your wok (or skillet) over high heat until a drop of water vaporizes in a second or two. Swirl in 1 tablespoon of oil, and add the ginger, garlic, shallots, and chile pepper. Stir-fry 20 or thirty seconds, or until fragrant and softened a bit. Stir in the sunchokes and cook until they take on a hint of color, then add the corn, all the while pushing the ingredients around the pan. If you feel like you need a touch more oil at this point, swirl a bit more in before adding the rice, and stirring well to combine. If you like less separation in your fried rice, you can stir another beaten egg straight into the rice at this point, it's optional though. If added, stir well, letting the egg cook through. Swirl in the soy sauce, and continue to toss the ingredients. 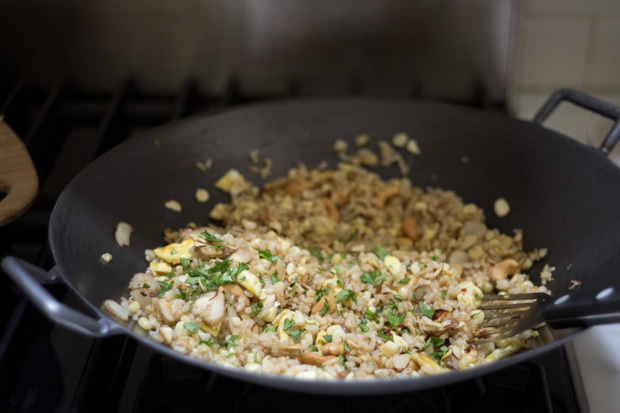 Add the egg crepe, almonds, and cashews, then taste and work in more soy sauce if needed (or perhaps a bit of salt and pepper instead). Quickly turn out onto a platter to serve, sprinkled generously with chopped basil. Serves 2-3 as a main course, more as part of a larger multi-course meal.